The sign above was carved in 2.5-D relief with raised text and border, The text in the border is engraved. 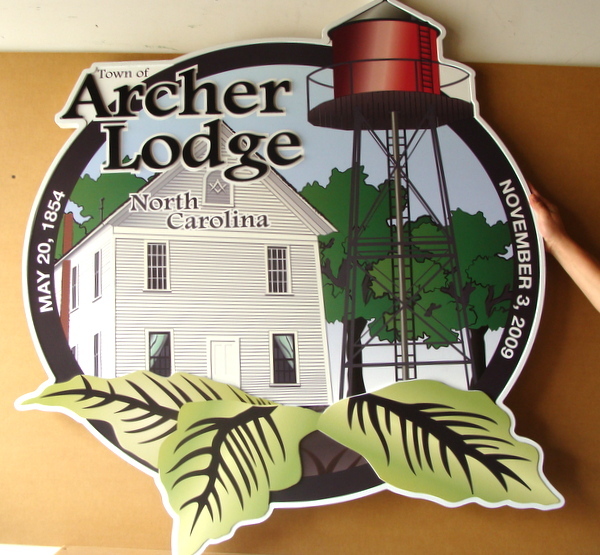 For this sign , the customer wanted to feature a painting of a building and water tank, which we printed on digital long-lasting vinyl. This picture will last 10 plus years without degradation, nearly as long as an oil enamel artist painting, and is less expensive. We use a variety of techniques for complex art - including both hand-carved and CNC carved bas-relief artist-painted art, artist-painted flat art, and digitally printed vinyl (for photographs and computer graphics art) . All our signs are clear-coated twice for additional protection against UV radiation and moisture.